echo artworks was started in 2003 by mother/daughter team Penny Morse and Beth Shea. Beth Shea is the owner, artist and chief mess-maker here at echo artworks. Her background is in biology and ecology, so any beading class is always sprinkled with some science-y info that relates to the materials of the day. Beth has been making jewelry and accessories for over 20 years and loves using found objects (aka junk) in her mixed media pieces. She is an accomplished teacher and has been spending more time offering workshops at large trade shows around the country. Penny Morse is the brains behind echo artworks and spends most of her time trying to keep Beth on track and under budget. 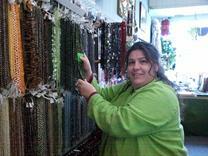 Penny's background is in counseling, so bead emergencies are met with a trained professional on hand. Penny enjoys designing jewelry, but will still hand the technical stuff over to Beth since she has an unnerving habit of breaking all things mechanical (Not kidding...it is weird).